1. 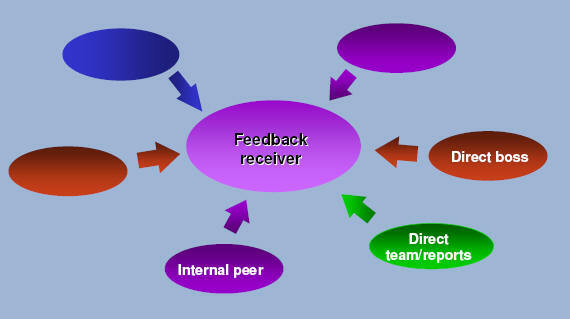 What is 360 degree feedback? 360° feedback is the process by which performance evaluations of an employee are collected from multiple sources including: subordinates, peers, customers, self-ratings, supervisor ratings, vendors, and suppliers. All aspects of the employee's performance are captured. Feedback is less vulnerable to bias and thus more objective. The use of raters from different sources increases the validity of assessments. Provides the ideal environment for goal setting initiatives. A good 360° feedback process communicates key organizational competencies and values, reinforcing organizational culture. 360° degree feedback places emphasis on teamwork, customer service, quality control, and process improvement. The supervisor concentrates on the strengths and weaknesses of an employees' performance. Effective capability development requires a clear understanding of how individual performance links to organizational strategy and critical success factors. clarify the impact of organizational strategy in determining the competencies critical to individual performance. Including a business-driven competency model, selection, succession, assessment, curriculum development, development planning and activities, training, follow-up, and progress monitoring.. The purpose of data collection is to learn about critical incidents/stories that reflect effective performance of the job or role targeted in the study. Decide who will be interviewed (population or sample size). Determine data collection format (one-on-one interviews/focus groups). Choose data recording methods (taping, using two interviewers, extensive note taking by one interviewer). Provide the interviewee with background on the project and a preliminary set of questions to ensure the discussion is focused and to the point. Use open-ended questions (allows interviewee to respond in a full and complete manner). Ask for stories and examples (show what they do, how they do it, and why they do it). Search for specifics (ask follow up questions to uncover the thought processes, specific behaviors used to resolve a situation). Avoid leading or directing the interviewee (by using empathetic responses or prompting them). Let the interviewee talk (90% of the time). Ensure that everyone participates (individuals should not dominate the conversation and facilitator should engage the quiet individuals). What people say they do and what they actually do sometimes differ because they may describe the ideal behavior or expected response. Direct observation offers a reality check against the information gathered during the interviews and creates a realistic picture of effective job behaviors. Observe at least three people who have not been previously interviewed from each performance category - exceeds, meets and falls below criteria. Observations need to take place on a typical day - no special events scheduled. Observer should sit away from the main interaction but close enough to hear the conversation. Examine the data collected during interviews, focus groups or observations for themes and patterns, which are then analyzed to identify relevant competencies. Identification of themes and patterns (individual work). The interviewer combs through the information gathered and identifies common themes and patterns. Start with a general idea (based on repeated behaviors and skills., and patterns emerging in the interviewees descriptions of how they handled specific situations). Start with a blank list (data analyst records any quote that refers to particular skill, knowledge, or characteristics. Using the complete list, the frequency of similar comments is noted). Identification of themes and patterns (project team meeting). All individual interviewers review the themes and patterns emerging from the interviews and the supporting evidence of such themes and patterns. As a result of the group review some themes will be reshaped, others eliminated and interim competency model will be produced. it must be validated as a predictor of successful performance (competencies must be demonstrated by the top performers in the job). The purpose is to test the accuracy and relevance of the interim model with a broader cross section of incumbents and stakeholders than that included in the initial data collection phase. Circulate the model to a wider audience (ensures all relevant competencies have been captured and uncovers meaningful demographic or functional differences in the applicability of the model). Collect data (survey or focus groups) to determine how well people currently in the position or role feel that the competencies reflect the skills, knowledge, abilities,; and personal characteristics necessary to succeed. New data will enable the interviewer to determine if their assumptions about needed competencies are shared by most incumbents and informed observers. Eliminate items considered unimportant, add or modify items viewed as more relevant. By now the interim model has been tested and refined and determined to have a high degree of face validity. If the model is to be used for training and development only, face validity may be sufficient. If the model is to be used as a basis for selection, appraisal, or compensation systems the additional step of validating the model is essential. If the model is used for hiring decisions, it needs to show how well the competencies predict success. If the model is used for performance appraisal decisions and recommendations, it needs to show how often the most effective managers use the competencies and when they correlate with measures of performance such as productivity, increases in sales or profit, employee satisfaction etc. Convert competencies into a 360 questionnaire. Select four to six specific and observable behaviors that illustrate competency on the job. Arrange the items so that they illustrate each competency in a survey format. A rating scale accompanying such a list allows bosses, direct reports, colleagues, and customers to rate the importance of the competency, how often it has been used, and how often it should actually be used. Distribute the questionnaire to managers (appropriate sample size) who are above, at and below the performance criteria developed during the first stage of the project (keep performance levels confidential). Instruct them to distribute the questionnaire to five or seven direct reports, five to seven colleagues, and all of their supervisors. The raters complete the questionnaire and return it. Use a third party outside the organization to conduct perform the statistical analysis, and to ensure confidentiality. Tabulate the scores for each individual and analyze the strength of the relationship between the competencies and the aggregate ratings of the different performance groups. If there is a significant correlation between the competency and the high- performance group, the competency is said to have concurrent validity. Significant differences between competency scores of high performers and low performers are also considered. If there are weak relationships between a competency and the high performance group, consider reviewing the clarity of the behavior descriptions. The soundness of the performance criterion used to select the groups could also explain the weak relationship. Using the analysis of the 360-degree data, finalize the model by eliminating any categories or items that do not correlate with effectiveness. At this point the competencies and their associated behaviors can be used as the basis for developing or enhancing tools used for human resource decision-making and establishing performance coaching priorities. The ability to integrate competencies into the day-to-day activities is very critical to organizational success today. The Capability model defines six core capabilities critical to how individuals contribute to organizational performance. The capabilities have, at their core, outcomes that help drive organizational effectiveness. Each capability is further defined by a set of integrated competencies necessary to fulfill that capability.